East is where the sun comes up. Let's All Shine! Welcome to East Elementary School! We are very proud of our facility and our educational family. Our goal is to share with you some of the history and highlights that make East a special place to be. 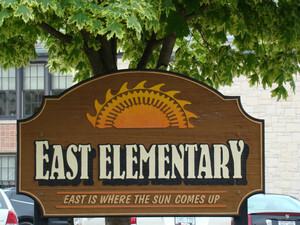 East Elementary was built, as an elementary school in 1939. It is a beautiful Lannon stone building that flaunts a slate tile roof. The hallways have colorful ceramic tile floors and the original classrooms have newly refinished hardwood floors. Passersby have a difficult time believing it is a public elementary school. In 1956 there was an addition constructed that consisted of classrooms and a basement area that is now used for the school cafeteria. Our most recent addition took place in 1998. This addition offered us the luxury of two new kindergarten centers, an art room, and a state of the art library/media center with a 25-station computer lab. Along with this addition came a complete renovation of the entire structure. New windows, lower ceilings with additional lighting, and an upgraded heating and air conditioning system are just a few of the improvements that help to make our home more comfortable for students and staff. Our building houses two to three classes at each level, Early Childhood through the 5th grade. At present our enrollment is 328, with an average class size of 21 students. We have a 51 member staff that consists of certified teachers and paraprofessionals that are all dedicated to providing the best education possible for our students. © 2019 School District of Jefferson. All Rights Reserved.